The Farmacopia Seasonal Cleanse is a comprehensive body cleanse and building program comprised of four distinct cleanses scheduled harmoniously with the seasons. Following the rhythms inherent in nature, The Seasonal Cleanse takes you through the year, giving you the opportunity to get back on track and let go of what’s not working, while fueling your system with essential foods, herbs & nutrients to help you thrive in the next season. Throughout the year you’ll have the opportunity to participate in any or all of the four Seasonal Cleanses. 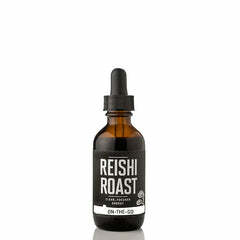 Each Cleanse [or season] focuses on a different body system, clearing toxins and cellular burden, fortifying you for the unique health challenges commonly faced in that season. Spring [Happy Liver Detox] Designed to clarify, cool and detoxify. 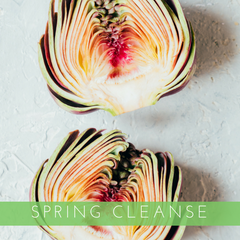 In this cleanse we support your innate detoxifiers, think: liver, gallbladder and gut, with the cleansing power of spring herbs so you’re fresh and vibrant for the coming rays. This is particularly recommended for those seeking to lower their allergen burden for greater defense during allergy season. 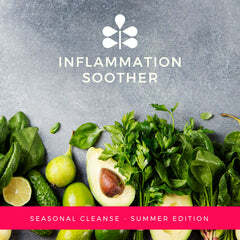 Summer [Inflammation Cooler] Relieve, soothe and hydrate with the Summer Cleanse. This season we focus on lymph and inflammation-combatting support. Soothe irritated tissues while gently clearing out the inflammatory detritus that registers as bloat, fatigue, brain fog, aches and pain. Autumn [Immune Builder] Nourish, protect, build. The Autumn Immune Builder is practical guide to staying well and healthy during germ season. We show you how to stave off pathogens at your most vulnerable points of entry and incorporate immune boosting herbs, vitamins and rituals into your daily life. And don’t worry, if you do get sick, we also have some herbal remedy tips to get you on the path to recovery faster, and more naturally. 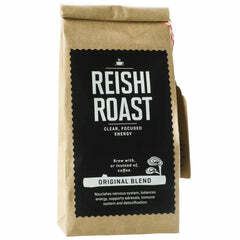 Winter [Gut & Stress Soother] Digest, de-stress and soothe this Winter. In this New Year’s edition we dig in and undo the burdens accumulated throughout the holiday season — when stress is high and decadent food abundant. Here we round up the season’s best warming herbs to stoke digestive fire, soothing botanicals and probiotics to heal and nourish damaged guts while learning to cope with stress the holistic way. To download this season’s Summer Inflammation Soother Guide, click here.